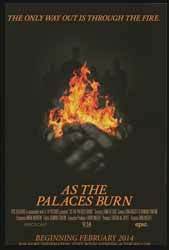 As The Palaces Burn (2013 - 1 hr, 30 min, 49 sec) is a documentary film which originally set out to follow the band, The Lamb of God, on a world tour, sharing the thoughts of their fans to show how music has the power to unite peoples. That was the original remit, however, half way through filming the documentary, the lead singer was arrested in Prague on a charge of manslaughter. It may be that the subject matter, that of a rock band which creates music which even one of their number labels as unlistenable, may not be a subject which will entice. However, for fans of the band there is very little of the music on display, but there is a lot of insight into the band. The film opens with an introduction to the band, all comfortably sliding into middle age with kids and mortgages to worry about. They have had wild times, especially the lead singer, Randy Blythe who has survived his years of heavy drinking. As he states in the film, music was his saving grace without which he would have been dead or in prison. It’s one of the most unfortunate prescient things which he states, given what happens. Following the original plan the first half of the film concentrates less on the band than their fans, a South America taxi driver who plays their music while he works and an Indian female heavy rock singer who draws strength from the band in her unconventional choices in life. Things change when the band get to Prague, where they are taken into custody by armed police only to discover that Randy has been accused of throwing a fan off the stage, two years previous, which had resulted in the fan's death. What follows is a fascinating look at both Randy, who had spent the first part of the film discussing personal responsibility and the legal process of the trial. Randy comes over very well, having made it back to the States, he did have the opportunity to stay and resist going back for trial, but everything he had previously said about his relationship with music and his fans is held up to examination and Randy is not found wanting, even though he faces jail. You have to admire the man, after all heavy rock gigs tend to be a bit over active and the band’s music does sound aggressive, so why wouldn’t the judges just throw away the key? Randy’s main motivation appears to be that the fan's family deserve to know the truth, even if he has no personal recollection of the event or the crime. What you end up with is a fascinating film about one man and his challenge with everything he believes in, in a strange way the film stays close to its original remit in that it examines the bands commitment to their fans, even under the most extreme circumstances.